Here we see that the reading of Holy Scripture provides us with a great weapon in the fight against the worldly temptations surrounding us—and we do not do enough of it. The Orthodox Church, far from being against the reading of Scripture, greatly encourages it. The Church is only against the misreading of Scripture, against reading one’s own private opinions and passions, even sins into the sacred text. When we hear that the Protestants are all excited about something that they say is in the Scripture—the rapture, for example, or the millennium—we are not against their reading the Scripture but against their misinterpretation of the Scripture. To avoid this pitfall ourselves we must understand what this sacred text is and how we should approach it. The Bible—the Holy Scripture, the Old and New Testaments—is not an ordinary book. It is one that contains not human but divinely revealed truths. It is the word of God. Therefore, we must approach it with reverence and contrition of heart, not with mere idle curiosity and academic coldness. Nowadays one cannot expect a person who has no sympathy for Christianity, no sympathy for the Scriptures to have a proper attitude of reverence. 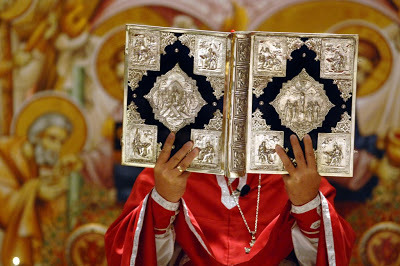 There is, however, such power in the words of Scripture—especially in the Gospels—that it can convert a person even without this proper attitude We have heard of cases in communist countries; the police go out in special squads to persecute believers and break up their meetings; they confiscate all their literature: Bibles, hymn books, patristic texts—many written out by hand. They’re supposed to burn them, but sometimes either the person who is assigned to bum them or the person collecting them gets curious and begins reading the condemned materials. And there have been cases where this has changed the person’s life. All of a sudden he meets Jesus Christ. And he’s shocked, especially if he has been raised with the notion that this is a great evil; here he discovers that there is no evil here but rather something quite fantastic. First, some examples of how to misinterpret Scripture. There are in Scripture numerous passages which seem to contradict other passages. For example, ‘Whosoever abideth in God sinneth not, and Whosoever sinneth hath not seen Him, neither knoweth Him’ (I John 3:9). According to the plain meaning of this passage you would think that a person who becomes a Christian ceases to sin. If this is so, why do we have confession? Why do we look at ourselves and see that we constantly sin? Does this mean that we are not really Christians? But in this same epistle we read: ‘If we say we have no sin we deceive ourselves, and the truth is not in us’ (I John 1:8). How can the same writer say two such seemingly contradictory, things? It’s obvious that we must have a deeper understanding of both passages. We must understand that while we have the grace of God we do not sin; when we sin it proves we have lost the grace of God, and we must struggle to regain it. We must recognize that there is a standard, a model which we must follow, which is not to sin. We must not deceive ourselves in thinking that we are constantly in a sinless state; rather, we are constantly striving towards it, sometimes reaching it and then falling away. That is our Christian lift. These passages must be read with an awareness of what it is to struggle as an Orthodox Christian. Once we were visited by some Protestants who told us that they interpreted the Bible absolutely literally. I asked them about the passage, “Except ye eat the flesh of the Son of Man, and drink His blood, ye have no life in you”‘ (John 6:53). And the first thing they said was, “Well, that is not literal.” Immediately they contradicted themselves. They think that they accept everything literally, but they make excuses for not accepting literally those passages which do not agree with their beliefs. This is precisely what many Protestants do; not having the whole context, not having the whole, reasoned theological dogma, they quote the Scriptures just as they occur: “It’s obvious that’s what it means.” But Scripture must be placed in context, in the complete picture both of the book in which they occur, in the rest of Holy Scripture, and in the whole teaching of Christ as handed down in His Church. “Therefore, reflect, I beg you, on how great is God’s wisdom, that by means of such sensuous examples, which seem to us to be lowly, He depicts for us and like an artist sketches out in our mind that which is unthinkable and unapproachable. He does this so that unbelievers might remain blind, deprived of knowledge of those good things of heaven, since they have become unworthy of this by reason of unbelief. But believers, on the other hand, hearing and receiving with faith the word of the parable, might see the truth and clearly know the reality in the things which are shown by the parables, for parables are the images of spiritual things.” (Homily 53) St. Simeon teaches that the epistles of the apostles also contain many hidden things, in addition to the things which are said plainly. Closely related to the literal vs. the mystical meaning of texts are cases in which a particular text has many meanings, where material objects are spoken of in order to raise our minds to spiritual realities. This is not to say that we should deliberately search the Scriptures for symbols, as if whatever is said means something else; rather, it is a matter of raising ourselves to a spiritual level where we can begin to understand the spiritual reality about which the inspired writers often speak. Thus, when David says, “Thou has broken my bonds asunder” (Ps. 115), he is not merely speaking of physical bonds and using this as a symbol of deliverance from corruption and death. This is the mystical meaning. But he is not using this worldly image of “bonds” in order only to express the mystical meaning, the lack of corruption or immortality; he is also speaking at the same time on a second level of meaning, using the physical image as an opportunity to express the spiritual truth of deliverance from corruption. If we already know the Christian teaching of Adam’s fall, the corruption of the world, and our redemption by Jesus Christ, and if we are struggling to raise ourselves to this spiritual level, we do not need a commentary to explain the words; that is, the Holy Fathers will help us, but we don’t need a commentary to tell us that “x=y.” The words themselves express the spiritual meaning. Anyone who reads and prays with the psalms has experienced this. Especially in times of sorrow, the words of psalms acquire a new and deeper meaning; we find that physical things refer to our own sorrows and dejection and our need to receive deliverance from Christ.